The Battle of Liege was the opening engagement of the German invasion of Belgium, and the first battle of World War I. The attack on the city began on 4 August 1914 and lasted until the 16th when the last fort finally surrendered. The invasion of Belgium was the event that triggered the United Kingdom's entry into the war; the unexpected vigor of the city's defense allowed more time for the western Allies to organize and prepare their defense of France. As Imperial Germany feared a long two-front war against France and the Russian Empire, the Schlieffen plan was conceived which suggested a quick strike to beat France first (as was done successfully in the Franco-Prussian War of 1870), and then an eastward turn toward Russia (which was seen as being slower to mobilize). In order to do this, neutral Belgium had to be attacked and crossed within a few days. 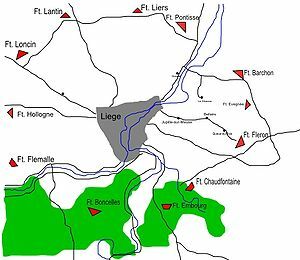 The highly fortified city of Liege was in the path of the German forces as they advanced through Belgium. The summer of 1914 saw tremendous diplomatic and military activity as a result of the assassination of Archduke Franz Ferdinand, the crown prince of Austria. As the summer wore on, war became inevitable. Germany, honoring her alliance with Austria, declared war on Russia on 1 August, she then sent an ultimatum to France (Russia’s ally via the Triple Entente) on 2 August. Another ultimatum also went to King Albert I of Belgium. Germany’s Schlieffen Plan (developed over the previous two decades), called for a vast sweep of manpower around the concentration of French armies along the Alsace frontier. That flanking maneuver, designed to bypass both the French forces and the rugged terrain of the Ardennes, necessitated the German violation of Belgian neutrality. Belgium could have offered no resistance and allowed German troops through her land on their way to France. Indeed, much of the German planning depended on them doing so; anything else would be nothing more than “the rage of dreaming sheep,” according to one Prussian officer. Unfortunately for German plans, Belgium proved all too willing to defend her sovereignty. Unfortunately for the Belgians, their resources did not match their �lan. Belgium’s fixed defenses and planning were dependent on resisting any potential enemy: Germany, France or Britain. At the beginning of August 1914 her armies were on the perimeters of the country, as they had been for years. When Albert received the ultimatum from Berlin, his chief of staff, General Selliers de Moranville, began implementing the standing contingency plan: to concentrate the army in the center of the country while allowing the fortifications at Liege and Namur to slow-down, if not stop, the German advance. Liege straddled the primary road through Belgium toward France. To the south the ground was rugged, to the north it was open but less than a dozen miles from the Netherlands, which Germany did not want to enter. Both Liege and Namur possessed outstanding fortifications, but also had serious shortcomings. Liege was surrounded by a dozen forts, designed and built by Henri Alexis Brialmont, the leading engineer of the latter nineteenth century.) Rejecting the star fort system of the French master Vauban, Brialmont designed forts to resist newer rifled cannon. They existed mainly underground, exposing only mounds of concrete, masonry and soil. Each fort possessed a series of retractable cupolas that held guns ranging in size up to 6 inches. While state-of-the-art upon their completion in 1892, they had not been well maintained. Brialmont also called for smaller fortifications and trench lines to be built linking and protecting the main forts, but the Belgian government had not done that either. Their garrisons were not at full strength and many men were drawn from the local guard units and had received minimal training. On 2 August King Albert responded to Germany’s ultimatum by ordering that work begin on support works, as well as that the army be mobilized and brought up to proper strength. The commander of the Liege fortresses, Lieutenant General G�rard Leman, was ordered to "hold to the end with your division the position which you have been entrusted to defend." There was little opportunity for the Belgian forces to finish all their preparations, German forces entered the country early on 4 August. The German force detailed to occupy Liege was a provisional unit called the Army of the Meuse, consisting of eight brigades commanded by General Otto von Emmich. Emmich commanded primarily infantry and cavalry and was detailed to capture the bridges across the Meuse at Liege and seize the town if it offered any resistance. When his troops reached the river and found many of the bridges destroyed, they began work on pontoon replacements. When these came under fire, the Germans realized that they would indeed be forced to fight for Liege. Picture - Diagram of the fortresses of Liege. Liege lies at the confluence of the Meuse and Ourthe rivers, between the Ardennes Forest to the south and Maastricht of the Netherlands and the flat plain of Flanders to the north and west. The Meuse flows through a deep ravine at Liege, posing a significant barrier. The city lies on the main rail line leading from Germany to Brussels, and eventually to Paris - the same railway that von Schlieffen and von Moltke had planned to use as transport into France. Massive industrial facilities, factories and other installations would assist in the defense of the city. The main defenses however, were a ring of twelve forts which had been completed in an 6-10 km radius around the city in 1891. The forts overlapped each other's protective zones of fire and were designed so that if any one fort were attacked, its two neighbors could provide artillery support. They were approximately 4 km apart. The forts were triangular or quadrangular in shape, with a surrounding ditch and barbed-wire entanglements. They were made entirely of concrete and armed with 210 mm howitzers, 150 mm and 120 mm cannons and 57 mm rapid-fire guns for approach defense. The fort was defended from attack by infantry with rifles and machine guns. The main guns were mounted in steel turrets that revolved 360 degrees. Only the 57 mm turret could be elevated. In total the forts had 78 pieces of artillery. They contained magazines for the storage of ammunition, crew quarters for up to 500 men and electric motors for lighting. The forts were not linked together and could only communicate with each other by above-ground telephone or telegraph. The forts had several other weaknesses. The terrain was difficult to completely cover since many ravines ran between the forts. Interval defenses were constructed just before the battle and were insufficient to stop the Germans from infiltrating the city. The forts were also weak in the rear, the direction from which the German bombardments would eventually come. Ventilation and sanitary conditions were very bad, resulting in a lack of air and terrible odors. Finally, the concrete was not the best quality and the forts were built to withstand assault from 210 mm guns, the largest mobile guns available in 1890. Leman had been personally selected to command the 3rd Division and the Liege fortifications; he was under orders from King Albert to hold the fortress system to the end. Leman had a force of about 30,000 soldiers to defend the intervals and about 6,000 fortress troops, including members of the civic guard. 9th Mixed Brigade, including the 9th and 29th Infantry Regiments, along with the 43rd, 44th, and 45th Artillery Batteries. 11th Mixed Brigade, including the 11th and 31st Infantry Regiments, along with the 37th, 38th, and 39th Artillery Batteries. 12th Mixed Brigade, including the 12th and 32nd Infantry Regiments, along with the 40th, 41st, and 42nd Artillery Batteries. 14th Mixed Brigade, including the 14th and 34th Infantry Regiments, along with the 46th, 47th, and 48th Artillery Batteries. 15th Mixed Brigade (5 August), including the 1st and 4th Chausseur Regiments, along with the 61st, 62nd, and 63rd Artillery Batteries. The Fortress Guards, including the 9th, 11th, 12th, and 14th Reserve Infantry Regiments, an Artillery Regiment, four reserve batteries and various other troops. 3rd Artillery Regiment, including the 40th, 49th and 51st Artillery Batteries. Overall, there were about 36,000 troops and 252 artillery pieces to face the German invasion. 11th Infantry Brigade of the III Corps, commanded by Major-General Von Watcher. 14th Infantry Brigade of the IV Corps, commanded by Major-General Von Wussow. 27th Infantry Brigade of the VII Corps, commanded by Colonel Von Massow. 34th Infantry Brigade of the IX Corps,commanded by Major-General Von Krawewll. 38th Infantry Brigade of the X Corps, commanded by Colonel Von Oertzen. 43rd Infantry Brigade of the XI Corps, commanded by Major-General Von Hulsen. II Cavalry Corps, commanded by Lieutenant-General Von der Marwitz, consisting of the 2nd (Major-General Von Krane), 4th (Lieutenant General Von Garnier) and 9th (Major-General Von Bulow) cavalry divisions. Overall, the force consisted of about 59,800 troops and 100 artillery pieces. These were placed under the command of General Otto von Emmich, accompanied by Erich Ludendorff as an observer for the Generall Staff. War was declared on Belgium on the morning of 3 August, the lead elements of 'Army of the Meuse' crossed the border at 0800 on the 4th. The cavalry advanced to the Meuse river, but found that the bridges had been destroyed. By the late afternoon of 4 August, the German cavalry had crossed the Meuse to the north at Vis� and encountered troops of the 12th Brigade, who had conducted a valiant retreat to the fortress line. German forces were held in check in the north for the night. The Belgian 3rd Division guarded the town from behind hastily constructed earthworks, on the same day they successfully repulsed attacks by German infantry passing between the forts. An attack against Fort Barchon was beaten back with heavy losses due to machine-gun and artillery fire. After this failed attack, the Germans carried out one of the first air raids in history by using a Zeppelin to drop bombs on Liege. Meanwhile cavalry moved south from Vis� to encircle the town. With the town likely to be invested soon, Leman ordered the 3rd Division to withdraw and rejoin the mobilizing Belgian army to the west. On 6 August, General Ludendorff rode forward to find that the commander of the 14th Brigade had been killed. He took personal command, ordered up a field howitzer to provide fire support and fought through the village of Queue-du-Bois to a high point from where he could look down into Liege. Ludendorff sent a party forward under a flag of truce to demand Leman's surrender (which was refused). A raiding force that followed was shot down at the door of Leman's HQ. This sally prompted Leman to leave the city and take refuge in Fort Loncin on the western side of the city. The outer ring of forts continued to hold out, blocking the German advance due to their interdiction of the rail lines. The forts endured steady bombardment and attack by the German forces, but most of the forts continued to hold out. Only Fl�ron was put out of action, its cupola-hoisting mechanism being destroyed by shell fire. The only fort to be captured by infantry assault would be Fort Barchon, taken on 10 August. To reduce these fortifications, the Germans would have to employ their massive siege artillery. These would include the Krupp "Big Bertha" 420 mm howitzer and some loaned Austro-Hungarian 305 mm mortars built by Škoda. At the time of construction of the forts it was assumed that the largest guns that could be moved overland were 210 mm howitzers, so they had never been designed to withstand the enormous shells from the larger guns. The shells from these guns landed on the forts from directly above, penetrating the concrete sides and then detonating inside by means of a delayed fuse. One by one the forts were pounded into submission, with the last, Fort Boncelles, capitulating on 16 August. On the 15 August Leman was injured at Fort Loncin, he was carried out unconscious to become a prisoner of the Germans. By the morning of the 17th of August, the German First, Second and Third Armies, in accordance with the Schlieffen Plan, were gearing up to move on with a sweeping push through the rest of Belgium, forcing the remains of the Belgian Army towards Antwerp and capturing Brussels without a fight on August 20. It is not clear what effect the ten day resistance in and around Liege by Leman and his troops had on the overall timetable of the German Schlieffen Plan. What is evident is that the battle was regarded as a moral victory by the allies. No one had expected the Belgians to fight at all, certainly not to fight so effectively. Could the major powers of Europe not fight to the end if tiny Belgium had? “The triumph was moral-an advertisement to the world that the ancient faiths of country and duty could still nerve the arm for battle, and that the German idol, for all its splendour, had feet of clay”. This regard is further demonstrated by France's awarding the city of Liege with the L�gion d'honneur in 1914. Another effect was a reduction in faith with regard to fixed fortifications, felt by all sides, and leading to the weakening of the forts around the city of Verdun, France. This weakening would have an impact on the battle fought there in 1916. Keegan, John, The First World War, Vintage Books, 2000.